Last night, I was talking with my daughter Katie, a senior in college. We were chatting about the tv shows she’d been watching – and she mentioned the fact that she didn’t have a DVR. WELL! Can you imagine? No DVR in college? It got me thinking about all the things I didn’t have back when I was in college, in the ancient times of 1979-1983. Not that I knew any better – most of the things our kids use on a daily basis now didn’t exist back then – so I thought I’d take a little walk down memory lane and recall a day in the life of me, in college – and probably you too, if you’re an empty-nester or baby-boomer. Please note, all the corresponding items and/or activities of today are in parentheses. Wake up for class to a clock radio (CELL PHONE). Shower and blow dry my hair (STRAIGHTENER, “PRODUCT”). Get dressed and go to class. During class, I take notes and listen, bored half the time, but with no other choice (IPOD, TEXTING, CELL PHONE). Decide to write a letter to one of my friends at another school (FACEBOOK, TWITTER, EMAIL, TEXTING, INSTANT MESSAGING). Realize I haven’t talked to my parents in a week, make a mental note to call them when I get home (SEE ABOVE). After class, I head to the library, where I check out books, which I look up with the Dewey Decimal System (COMPUTER). Again, stop to use a pay phone to call a classmate about an assignment (CELL PHONE, COMPUTER, ONLINE CLASS NOTES AND SYLLABUS). After I finish my classes for the day, I head to work, where I make $3.75 an hour selling shoes. I’m not allowed to use the business phone for personal calls, so I have no idea what the plans are for that evening…it is Friday, after all. Have to wait until I get home to find out what’s going on (ALL SOCIAL MEDIA AS MENTIONED ABOVE, PLUS PHONES). I stop by the local camera shop to pick up prints of a roll of film I had developed (DIGITAL CAMERA, DIGITAL PHOTOS). When I get home, my roommates have left me a note with a couple of messages on it (VOICE MAIL and/or ANSWERING MACHINES). I call a couple of friends back. One isn’t home, so there’s no answer – imagine that! and one’s line is busy (CALL WAITING). I consider watching a little tv, but it’s mid-afternoon and there’s not much on the 5 channels we actually get in our apartment (CABLE, DVR, HULU, ONLINE TV). Break open a Tab (DIET COKE) and put an album on the stereo (IPOD, DOCKING STATION, ITUNES). When my roommate gets home we debate having either Top Ramen or Domino’s pizza for dinner (once again, some things are pretty darn constant). I have a few hours until its time to go out with my friends, so I start to write the final draft of a paper for one of my classes. 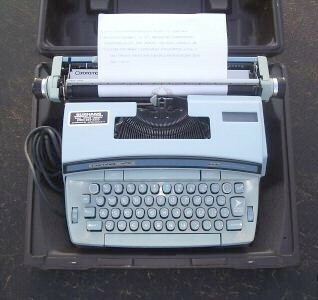 I drag out the Smith Corona – electric – which was my high school graduation gift (COMPUTER). I change the ribbon on it because it’s starting to look a little faded. I get out the white out in case I make any errors, and the dictionary to check that I’m spelling words correctly (SPELLCHECK). There are a few facts that I’m not sure are right, so I have to wait until I get to the library the next day to research them (WIKIPEDIA, GOOGLE, ABOUT.COM, ETC, ETC, ETC). When I finish the paper, I’ll take it to the copy center to have a copy made for my professor, and I’ll hand in the paper in class the following week (HOME PRINTER, COPIER, EMAIL to TURN IN PAPERS). I dress to go out, dismayed to see panti-lines under my jeans (SPANX, THONGS, BOYSHORTS). Change into different jeans, feel better. Call my parents, but they’re not home (ANSWERING MACHINE AGAIN). After making dozens of phone calls, finally have a plan for the evening, so we head out, buy some beer, and go to a party (this will never ever change!). Later that night I have a headache and I can’t sleep, so I take some Tylenol and hope it will help (TYLENOL PM, ADVIL PM, MOTRIN PM, ETC). It’s interesting, isn’t it? So much of what we take for granted – and especially what our kids take for granted – was unimaginable back then. Sometimes I think all of the connected-ness can be detrimental – it’s as if, for some kids, they never really leave home – but overall, I’d love to try being a college student in 2011 – even without a DVR! Did I miss anything? 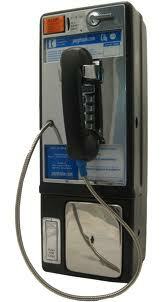 What other antiquated things can you remember? Observations about life, both important and inconsequential. Enjoying myself as an empty-nester!